Seeblick Cottages feature two well appointed units. The first is a large two bedroom bungalow style cottage. Each bedroom features a queen size bed. The living room and kitchen areas have vaulted ceilings providing an attractive and open area. 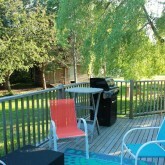 Outside there is a deck, gas barbeque and fire pit with fire wood and lots of seating provided. Within the cottage there is a small library and guests are encouraged to take home any book they haven't quite finished. The second unit is a large two story, three bedroom chalet with bath and a half. The chalet is a uniquely styled timber frame design with large comfortable rooms. Visitors are provided with dishwasher and laundry facilities within the unit. Two large decks and patio provide lots of space for outdoor relaxation. 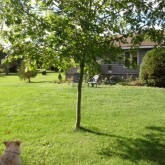 Both units are nestled in private treed properties in beautiful Brackley Beach. Just a short distance down lupin lane this tranquil setting is perfect for children and those seeking a bit of serenity. At the end of the lane there is access to the quiet waters of Brackley Bay where visitors can enjoy kayaking or windsurfing. Centrally located on PEI and within 15 minutes of both Charlottetown and the attractions of Cavendish, Seeblick Cottages are just a few minutes from the National Park beach at Brackley Beach. nearby restaurants, golfing, deep sea fishing and even a drive-in theatre give plenty of entertainment options.